Student worker busy at the campus bookstore. Being a college student is full of bills. Bills for tuition and fees, food bills, movie ticket bills. The list goes on and on. To help students pay these bills, a number of campus departments offer jobs for students. There are departments on campus in which a student can apply for a student assistant position, including the Moffett Library, Clark Student Center, and The Office of Residence Life and Housing. 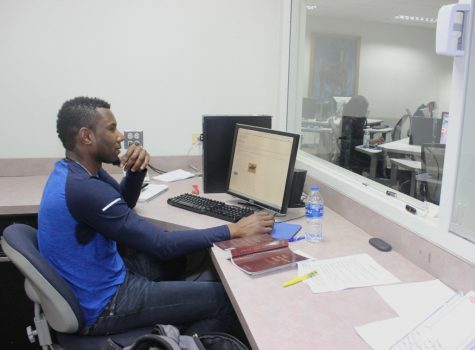 “There is a variety of positions on campus depending on the departmental needs. So the type of hours student works, the type of responsibilities and ways they would get involved in the department is going to vary depending upon whether it’s in the library, Clark Student Center, So there wold be a variety of opportunities for freshman and all students as they come into their life at MSU or are currently here,” Dirk Welch, director of the Career Management Center, said. 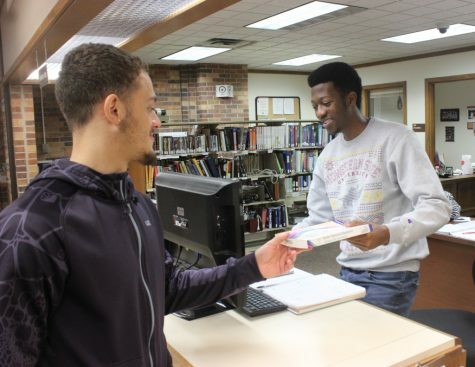 George Nahmo (right), mechanical engineering junior receives book from student at his library assistant work station. Photo by Sharome Burton. March 13. As of Sep. 1, 2018, there were 609 student employees on campus [including graduate positions] out of the total student population of 6,102, so about 10 percent. 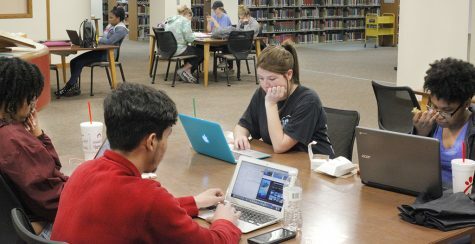 “Typically the number of students working on campus at any given time is between 480 to 500. That will fluctuate from semester to semester, but approximately 8 percent of our student population has a position on campus,” Welch said. Of the 609 students employees, 93 of those were filled by work-study positions. The work-study program provides on-campus jobs for students who have applied for financial aid and demonstrated financial need, allowing them to earn money to help pay educational expenses. “Work study opportunities are handled thought the financial aid process. They can be promoted by the mustangshire system but they are required to run through our financial aid department. Not all students qualify for work study but those qualifications the financial aid will know. 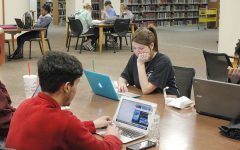 They have a way to calculate how much work study funds are available to each student that qualified,” Welch said. Welch stated just a couple some of the benefits a student may experience from working on campus compared to off campus. “Perhaps the main benefit is that departments on campus do recognize the importance of completing a degree and their understanding of academic obligations. Also, the hours that one can gain from working within a campus environment work well within ones academic schedule. So that’s some of the benefits, knowing that you are going to likely be employed in an area that understands the importance of ones degree,” Welch said. “There are employers likewise that do a lot of hiring of students that know they have academic obligations, but on campus you will find in the recognition of the students obligations and that everyone here wants to see them succeed and reach their lifelong potential,” Welch said. Student workers on campus gave their stories on the application and interview process and how they got hired for their current positions. Information desk assistant Samantha Quintero, education freshman guides student through application form. Photo by Sharome Burton. March 13. “I heard about a position available so I came and picked up an application, filled it out and sent it in. I got interviewed immediately because they needed someone to fill in that week. So it was an easy process for me because I handed in an application and got interviewed and hired on the spot,” Kerese Dias, accounting senior and student assistant at the Clark Student Center, said. 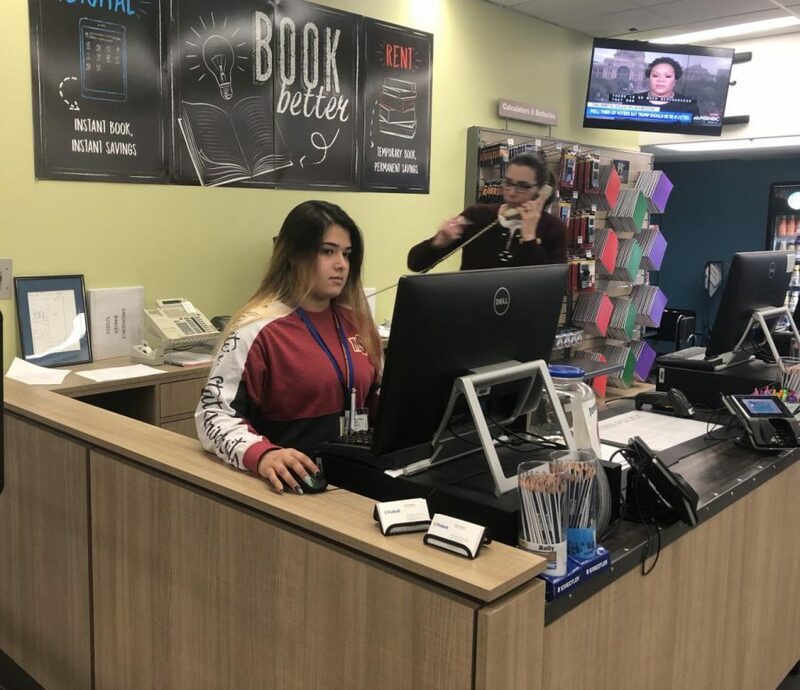 Brenda Morales, history junior and sales associate at the campus bookstore, had a similar experience applying for her job. “Basically our bookstore is owned by a company so I had to make a profile and go through the online application and then I called in and got scheduled an interview. Most people did a group interview but I got a one on one interview with our assistant manager and right there she basically hired me,” Morales said. Students, including Dias, also gave insight on what’s it like to working on campus and some of their favorite things about their jobs. “I get to meet students of different cultures when they come to the information desk. I also learn about a lot of what goes on in campus, because here the information is to have insight on things going on. They bring the information here for us to learn and know it so when students come here we can answer questions. Also, it gives me an opportunity to our interact with people from different departments and I get to learn more about what goes on in those departments,” Dias said. Morales also shared her thoughts on what the work environment is like at the bookstore. “My shifts are at 7:15 in the morning, so I think it’s just getting there that’s the issue. With our manager, it’s the idea that theres always something do so we always have to be fast paced and keep up with everything going on,” Morales said. Welch gave some advice for incoming or current students who may be interested in or are currently seeking out a job on campus. His tips for these students included using the mustangshire.org system, attending job fairs, and networking with peers. mustangshire.org, an online website powered through the Handshake system, allows students to search for full-time, part-time, and internship opportunities both on and off campus. 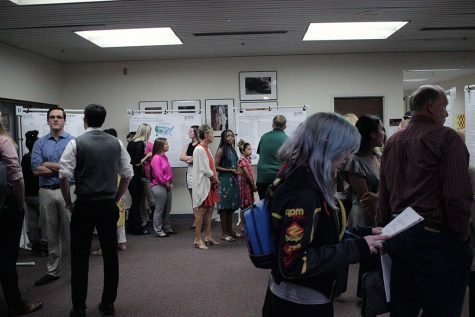 “One of which is to create a Handshake account so you can see postings of on campus opportunities as well as off campus and utilize that alert system to keep aware of when one opens up and how to go about applying,” Welch said. The system is updated weekly as the Career Management Center receives employment notices from on and off campus employers, allowing students to find career events and information. “One of the nice things about the mustangshire system is that students can set alerts if a department posts a position during any time of the year. While there are more periods of time when departments are posting opportunities or going through the hiring process, those alerts make it more seem-less for the students,” Welch said. There is an upcoming campus job fair on April 2 in the Clark Student Center from 11 a.m. to 1 p.m., and a summer employment fair to be held in late April. Another tip Welch gave for students is to attend the job fairs that the Career Management Center hosts throughout the academic year. “Attend all of the appropriate fairs. Each fall we do a part-time networking job fair, usually within the first three weeks of the fall semester. There have been on campus opportunities with the majority being off campus opportunities. This spring we are hosting a campus job fair, this will involve offices from around campus that are looking to fill student assistant positions. 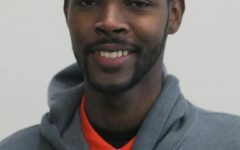 Then later on in April we do a summer employment fair which will largely be off campus job opportunities,” Welch said. Computer lab assistant Hansly Justin, psychology junior observes students from his work station. Photo by Sharome Burton. March 13. 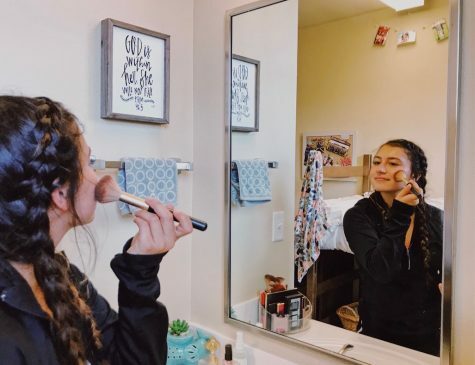 The last tip Welch gave was to network with potential employers as well as their own peers, such as classmates and roommates, to learn about job opportunities that could potentially be opening up. “Networking with peers will help you learn of opportunities before they come open in various departments across campus. We encourage students to pay attention and learn from their neighbors,” Welch said. With the amount of campus jobs held by students, many of them will open up after students graduate, so it would help to be alert of these opportunities. Student workers also gave their own pieces of advice for students interested in an on-campus job. “Apply. A lot of people don’t apply because they don’t think they’ll get it. I didn’t think I was going to get it but I got hired on the spot, so always come in with an open mind. It’s easier in my opinion to work on campus as a freshman because they’ll work with your classes, so working on campus is a good place to start. Theres a lot of different jobs on campus that are related to different majors so just find something that you enjoy on campus,” Morales said. 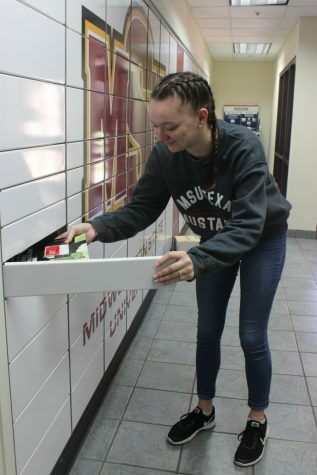 Gracie Payne, mathematics junior stores package in post office box as post office assistant. Photo by Sharome Burton. March 13. Lastly, Welch gave his insight on the outlook for student jobs on campus for the next academic year and whether there will be more jobs available. “The overall number of students working and the number of positions is likely to be the same. But each year there are folks that graduate and thats largely how positions on campus become available. 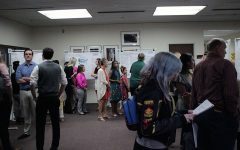 It’s not typically that we’re able to expand the number of student positions in a department, most often if there is a position open its due to the graduation effect,” Welch said.